These Spinach and Feta Puff Pastry Appetizers are loaded with savory flavors of garlic, green onions, artichokes, and salty cheeses. It’s a buttery puff of goodness that just about melts in your mouth. Simple make-ahead finger food that your guests will devour. Using a cheesecloth, squeeze as much water out as possible of both the spinach and chopped artichokes. 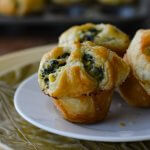 In a medium-size bowl, combine spinach, artichokes, onions, cheeses, salt/pepper, garlic, butter and 2 beaten eggs. Roll each sheet of puff pastry out (separately) to 10 x 10 inch. Using a pizza cutter, divide each sheet of the puff pastry into 9 equal squares giving a total of 24. Spray 2 mini muffin tins (24 muffins) with Pam spray. Press each puff pastry square into the bottom and sides the muffin tins. Place a heaping tablespoon of the spinach mixture into the square. Bring each corner up and twist to seal. Brush the additional beaten egg onto each spinach cup. Make-ahead instructions. You can prepare them in the mini muffin pans, and freeze them before baking. When they are frozen solid, pop them out of the pans and place them in a freezer bag to head back into the freezer. When ready to bake, place them back in the muffin tins, thaw and bake according to the instructions in the recipe. Appetizers made with Puff Pastry is best eaten the day they are baked.